We are living in a world where there are too many hatreds, wickedness and an unforgiving spirit. There is no way we can create a peaceful society where love thrives with a high level of wickedness and hatreds. This ugly cankerworm is, in fact, eating deep into the fabrics of our Christian community destroying our collective existence. How do we think that our Christian community will be inhabitable if we take joy in destroying each other's talents and gifts? Does it make us grow by not appreciating one another and our various talents? The first reading of today presents us with a scenario of love and hatred. It is a popular story of Joseph and his brothers, the sons of Jacob. Why was he hated by his own brothers? One of the reasons as recorded in this reading was that Jacob loved him more than others! The second reason is that he had a special gift of interpreting dreams. If we take a closer look at this reading, we will discover that Jacob loved his other sons as well if not, he wouldn't have sent Joseph to attend to them while they were in the field. Secondly, Joseph loved his brothers too because if he didn't, he wouldn't have accepted to go and give them food when his father Jacob instructed him to do that. The lesson we have to learn in this reading is that we should not be discouraged when people hate us for no just cause or trying to pay us with evil for being good, or trying to pull us down because of the gift or talents God endowed us with. When the going gets tough, let us hang on God because He will not abandon us. He will even raise people among those who hate us to speak well of us amidst their hatred. Just like what happened to Joseph. We see how God used Ruben and Judah among those who hate Joseph to speak on his behalf. It was the words of this two brothers that touched the others and made them to change their initial decision of killing Joseph. Reuben speaking on behalf of Joseph said " ‘We must not take his life’ he said. ‘Shed no blood,’ said Reuben to them ‘throw him into this well in the wilderness, but do not lay violent hands on him’ – intending to save him from them and to restore him to his father. This was the first attempt to save Joseph from the attack of his other brothers. On the other hand, Judah also said "What do we gain by killing our brother and covering up his blood? Come, let us sell him to the Ishmaelites, but let us not do any harm to him. After all, he is our brother, and our own flesh. His brothers agreed. I see the attitude of Reuben and Judah as a lesser evil. The good role they played towards saving the life of Joseph will eventually bring them salvation in the land of Egypt in the long run. If Joseph was killed by his brothers, I wonder what would have happened to them when they were facing hard times with their father Jacob. This is exactly how God will raise people who will speak for you when you see yourself as an object of hatred among others. 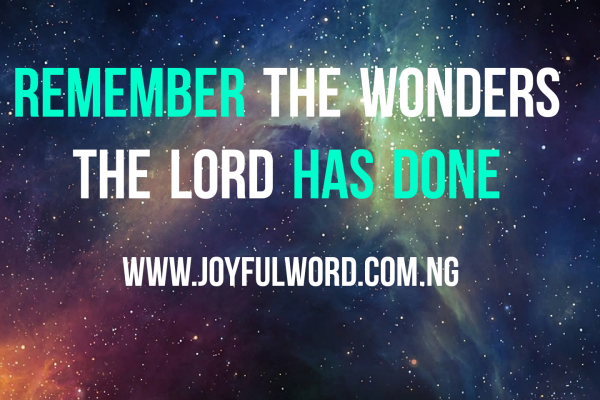 Still on this, the Psalmist encouraged us to remember the wonders the Lord has done and then never lose faith to hang on him always even when people are attacking us unjustly. The gospel reading is just a follow-up of love and hatred that the first reading highlighted. Here Christ made us understand that the wicked will definitely go unpunished unless they turn away from their wickedness. Let us during this Lent pray that God will give us the spirit of loving one another instead of hatred and wickedness. Let Us Pray: Lord Jesus Christ, give me a heart that loves always and may I not be jealous of anyone but support them to excel with their gifts. Amen.